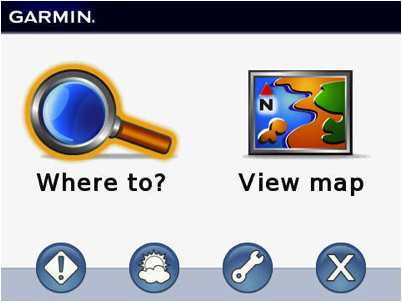 Garmin is a well-known name in the mobile and handheld GPS market. 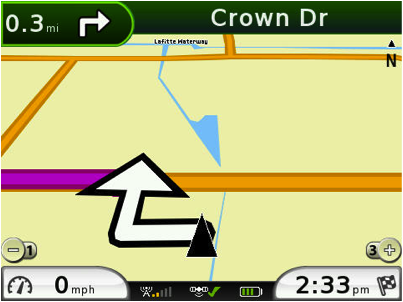 Garmin Mobile is one of the original GPS apps providing voice turn-by-turn directions for BlackBerry users. While there are numerous options for on-device GPS naviagtion, Garmin is one of the biggest names in the game. We reviewed Garmin Mobile version 5.4.5 using Verizon Tours running OS 4.7.1.61. Although Garmin's website states the only Verizon BlackBerry supported is the Storm, Garmin Mobile works on our Verizon Tours and presumably will work on any Verizon BlackBerry with autonomous GPS. Garmin has a free 7-day trial, so you can evaluate it for yourself. Supported devices: BlackBerry devices equipped with GPS. This includes: 8110 & 8130 (Pearl with GPS), 8310 & 8330 (Curve with GPS), 8800, 8820, 8830 and 9530. The Main Menu gives you navigation (Where to?) and general mapping capability (View map). Traffic, Weather, Settings, and Exit complete the Main Menu. Garmin offers fast, accurate route updates. It can automatically route you around traffic and areas you want to avoid, such as ferries, toll roads, and car-pool lanes. When you are navigating, you can view all the upcoming steps by pressing Menu and selecting View Turns, then scrolling the trackball up and down. Scrolling left and right controls the volume. Garmin shows the estimated time of arrival, but the display is not helpful for multi-day trips and it does not display time remaining to destination. It does not display miles to destination, nor the current road, and there is no way to repeat a missed verbal instruction. Garmin Mobile has bright, large, easy to recognize icons for common local search items such as Food, Hotels, Banks, ATMs, Shopping, Fuel, Attractions, Museums, Entertainment, Recreation, Post Offices, Car Washes and more. Garmin allows you to look up addresses in your contacts and save them to My Locations. 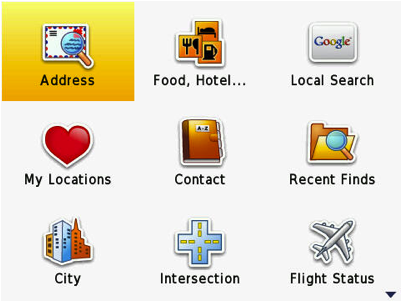 You can also search by intersection, city, recent finds, or launch a Google Local Search. Unfortunately there is no jump-to-first-letter capability in My Locations, so navigating around the list can be tedious if you have a large list. Also, there is no way to send or share a location with another user. Two neat features are Panoramio and Flight Status. Panoramio by Google works the same as it does in Google Earth. You see thumbnails of pictures people have posted. 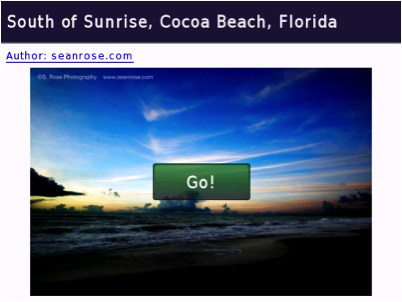 Click on the picture and you can get directions to the picture location. 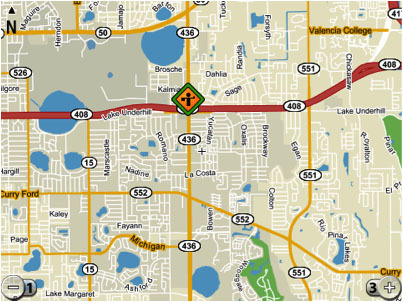 You can also see other options around the area of the picture, such as Find Nearby, View Traffic, and View Weather. Flight Status lets you choose Airports Nearby or Choose a City. You can check status by Flight Number or by Arrival or Departure City. 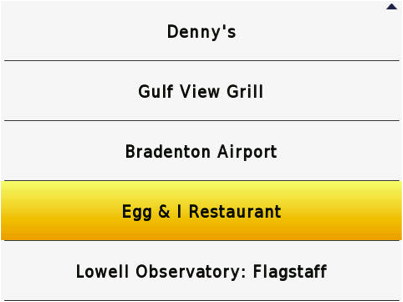 The airlines and flight from / to the selected city to your airport are listed alphabetically. Flight and airport data is provided by FlightStats.com. View map shows you the map of your current location. Unlike Where To mode, the maps in View Map mode do not have the option to rotate to show direction of travel up. If you are going North and turn right, you will move to the right on the map. If you turn right again, you will be moving down on the map, which can be confusing, as it appears to reverse left and right for turns. 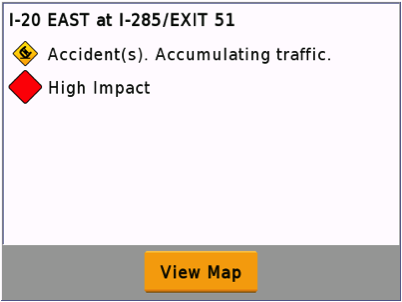 Traffic mode shows you a list of construction sites, congested areas, accidents and "accumulating traffic" and the potential impact on travel time. If you enter a City in the City icon under Where To, you can see the traffic in locations other than where you are at the time. If you select View Map, you can see the map of the area around the congestion, accident, etc, with icons showing location of the problem. 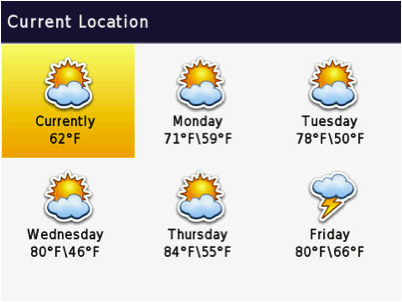 Weather gives you a six day forecast with hi/lo temps, chance of precipitation and conditions for your location. Just like with Traffic, if you enter a City in the City icon under Where To, you can see the weather in locations other than where you are at the time. Settings lets you specify Avoidances, choose which Points of Interest are shown, and Route Preferences (faster time or shorter distance). 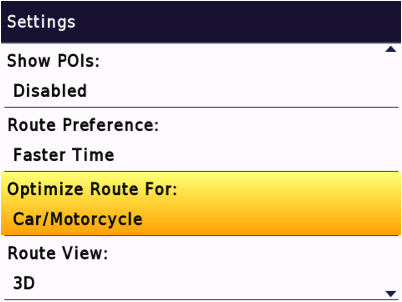 You can also specify whether a Route is optimized for Car/Motorcycle, Pedestrians, or Bicycles. In Route view, you have the choice of Track Up (2D), North Up (2D), and 3D (which always shows Track Up). Color Mode gives you the choice of Daytime, Night time, and Auto, similar to Garmin handheld units. Locale lets you specify units (statute or metric), Fahrenheit or Celsius temperatures, and 12 or 24-hr time format. This One-Time Purchase subscription applies to only one (1) Device. During the first twelve (12) months of your subscription, if your original Device becomes non-operational you may be permitted, at Garmin's sole discretion, to make a one-time transfer of the Garmin Mobile Application to another supported Blackberry Device. To make a request for such transfer, please contact the Garmin Customer Service department via https://crackberry.com/e?link=https%3A%2F%2Fwww.kqzyfj.com%2Fclick-3045577-12469246-1452185283000%3Fsid%3DUUcbUdUnU128946%26url%3Dhttp%253A%252F%252Fwww.garmin.com%252Fus%252Fsupport%252Fcontact&token=rKdRI9eQ No transfers are permitted, for any reason, after twelve (12) months from the purchase of your subscription. Although software fixes, updates and patches are included in the One-Time Purchase, a free upgrade to the next version(s) of Garmin Mobile is not. CrackBerry users have reported that Garmin is more generous with transfers than these terms indicate, but you should not plan on making a free transfer for a non-warranty reason. Garmin Mobile for BlackBerry provides an acceptable audible turn-by-turn GPS solution that is not tied to a specific carrier and, more importantly, does not have to be billed to your phone account. That may make it an option for corporate users who don't have control of their accounts. Verizon users may prefer the additional features and capabilities of VZNav. Garmin Mobile is available for a one-time $99 fee, subject to the license terms discussed above.